In recent years, the growing trend of personal genomics has spawned its own industry, with several companies now offering to sequence the genomes of individuals, with some even providing health analytics and ancestry information. A couple years ago, I sent a sample of my own DNA (via saliva) to 23andMe, Inc.; this sample was then used to perform sequencing on single nucleotide polymorphisms (SNPs) in my genome – and to provide me with a wealth of information about potential disease risks and ancestry. Conveniently, 23andMe also allows data to be downloaded in the form of a text file containing the identity of nucleotides at various SNPs, along with their positions across the genome. It turns out that this data can be rather easily explored with a little help from R and Bioconductor. What’s more, 23andMe claims to have data reproducibility of over 99% for their genotyping platforms, adding a high degree of reliability to trends discovered from this data. In the exploratory analysis that I performed on my own SNP data, I produced two visualizations of my genome (as well as a reference visualization based on public data) – all of these were aimed at performing a first-pass exploratory examination of the data…perhaps I’ll have a chance to perform a more thorough analysis soon (hopefully, no more than a few months time). The plot above is actually rather uninformative. 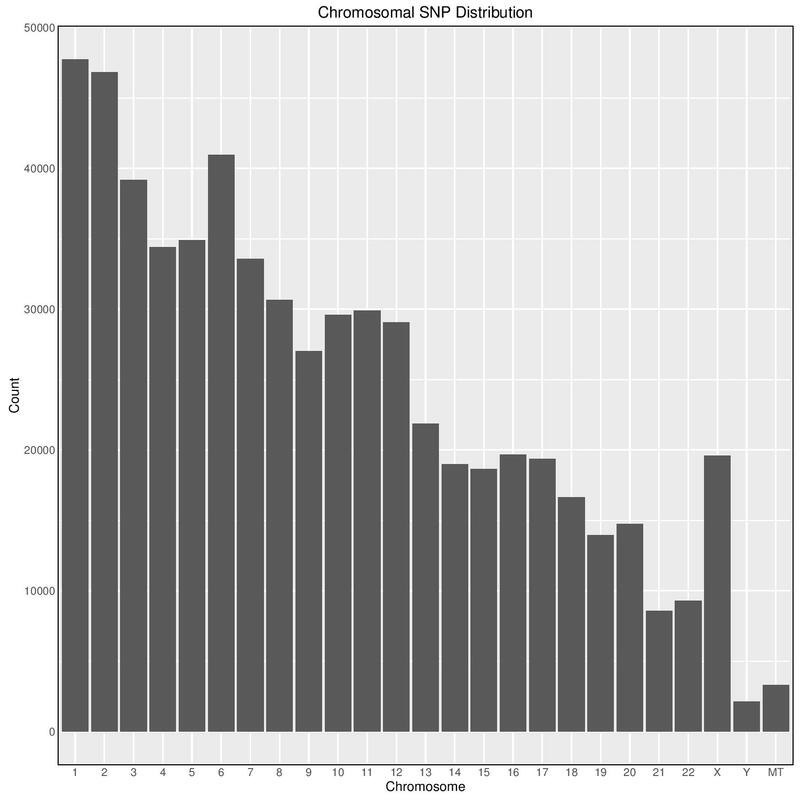 As it turns out, the number of SNPs is mostly a function of the length (base pairs) of a chromosome, so understandably, those chromosomes with more SNPs are just longer. To go further in the analysis, I made heavy use of the packages gwascat and ggbio. With the former, it was possible to merge data from my SNPs with information included in the gwrngs19 data set, which represents aggregated information from numerous genome-wide association studies (GWAS). Merging these two data sets, and then filtering the results by the allele risk values reported in GWAS studies, allowed me to find those alleles that put me at risk for a number of conditions, based on the current biomedical literature. 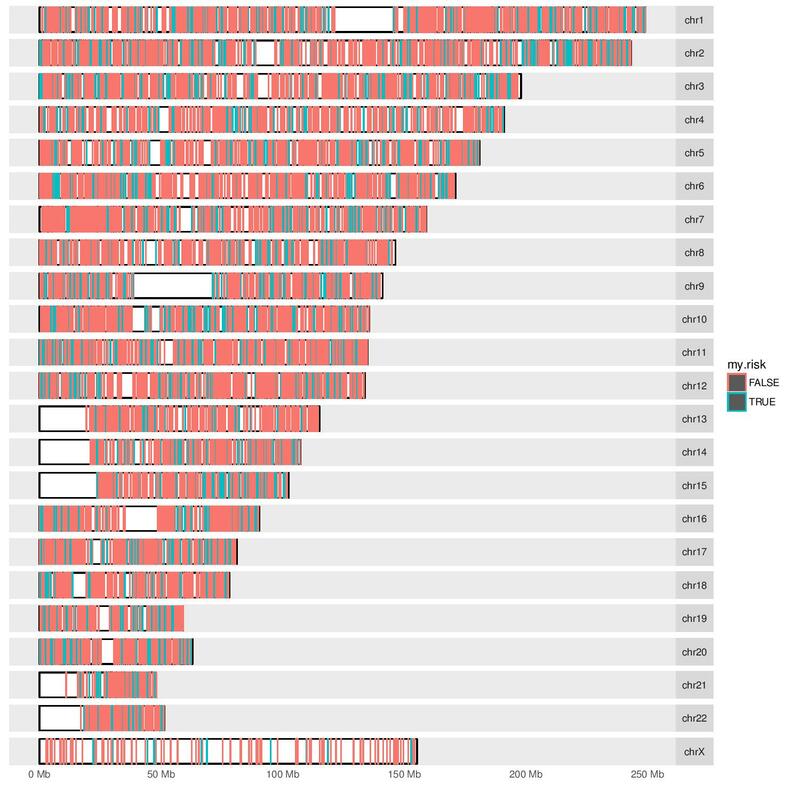 To visualize these results, I created karyotype-based visualizations of the distribution of my so-called “at risk” alleles across various chromosomes. Across all alleles available in public GWAS data, those alleles found in my data set are marked on each chromosomes, with those alleles associated with a higher risk of a given disorder marked in light blue (and those alleles not associated with a significant risk marked in light red). While the above represents a rough attempt at exploratory analysis of my SNPs, a number of avenues exist for going further (a few of which I hope to later examine and write about). My very quick analysis also led me to realize that despite the large number of personal genomics services, tools for analyzing this data personally appear limited, though a working knowledge of R seems to solve this problem…and I imagine much of the same may be accomplished using similar bioinformatics tools (Python’s Biopython and Julia’s BioJulia projects both come to mind). Credit where it’s due: Much of the analysis workflow described above was better documented in a helpful blog post by Vince Buffalo. The scripts I built are quite easily adaptable (feel free to use them and improve them) – they’re all available on GitHub here.